Ear cropping in dogs was a procedure done by vets in the previous century whenever dog owners requested it. Cropping is the removal of part, or all, of the outer ear, or the pinnae (externally visible flap) of the ear of an animal. Cropping the ears also involved taping the ears up after the surgery, to make the ears pointy. Why was ear cropping done in the past? Ear cropping was historically done on working dogs to reduce the risk of medical conditions like infections or haematoma. An othaematoma is when a small blood vessel in the ear bursts when dogs shake their heads (with ears flapping from side to side against the top and bottom of the dog’s head) and which causes the ear to “balloon” out with a blood-filled pocket in the ear. Although these initial reasons for doing cropping were sound, it turned into a cosmetic procedure over time and became more about “the looks” of the animal, rather than anything else. The surgical procedure of ear cropping was no longer done for functional reasons and was purely done for aesthetic reasons – “to give a dog that mean look”. In a world where dogs are still kept as a security measure, one can sympathise with those who believe that the scarier the deterrent, the more likely it is to be effective. However, also living in a world where perceptions change continuously, the question has to be asked whether it is fair to an animal and more particularly to dogs, to remove a part of their physical bodies, which has no apparent benefit to the animal itself under normal circumstances. Although an owner may desire their dog to look fierce and scary, this really does not help the already tainted reputation of some breeds. Breeds such as Pitbulls and Staffordshire Terriers (Staffies) are already seen as aggressive and scary, which is largely untrue. It is the people that use animals for fighting that cause them to have a bad reputation for being aggressive and unsafe animals. Ear cropping does these breeds no favours in the eyes of the public. Another reason for ear cropping was, and still is, to reduce injury during dogfights. The “less ear” there is for an opponent to grab onto, the better the fighting performance of the dog. A few centuries ago, dog fighting was considered a sport and a normal part of society (as was public executions of humans), but, in our day and age, this practice is strongly condemned by veterinarians. The debate on whether to allow ear cropping is a debate which has valid arguments on both sides. On a balance of arguments, the decision in South Africa has fallen to the benefit of the animal. The South African Veterinary Council, the regulatory and legislative body for the veterinary profession, decided after much consultation and debate over many years, to determine that ear cropping in dogs is unethical and is a procedure which should not be performed by veterinarians or lay people. If a part of the ear must be removed for medical reasons, then it is acceptable to do so. However, doing ear cropping as an elective surgical procedure for aesthetic reasons only, is now illegal, both for vets as well as non-vets. The ears of all dogs are extremely sensitive and have an extensive blood supply and take a long time to heal if cut. Further to this the muscles and nerves of the ears in dogs, are in general more prominent than in humans because dogs can move and manipulate their ears in so many directions and, depending on which direction noise comes from, have to be able to perk up their ears or turn it into the direction of where the sound is coming from. Some of these nerves and muscles are severed during the ear cropping procedure and may actually be more exposed and sensitive after the procedure than before. Some proponents of ear cropping will argue that doing a procedure where dogs whose ears naturally hang down next to the side of their heads like Boxers, Great Danes or Dobermans, will give the dog a better ability to hear if ears are lifted to be upright, as in the case of the German Shepherd. This is however not true. Firstly, a big part of the ear pinna or flap is removed during the surgery, leaving a much smaller part of the ear which is taped to stand up straight. This means that there is much less surface for sound to bounce against and be reflected into the dog’s ear for the dog to hear better. Secondly with dogs whose ears hang next to their heads, when they hear a noise and the ears perk up and they turn their heads and ears towards the noise, the ear makes sort of a cup, almost like a satellite dish, which allows sound waves to be reflected much more effectively compared to a small part of an ear which stands up straight and cannot “collect soundwaves”. Ears are used for hearing but also form part of the communication and expression repertoire of all animals. We have all seen a friendly dog, that pulls back its ears when called or stroked. In the same way, when dogs communicate with each other, they read each other’s body language by looking at every aspect of the other animal’s body, including the ears. By having the ears fixed in an upright position, the ability of the animal to communicate effectively is stifled because of limitations in the movement of their ears. 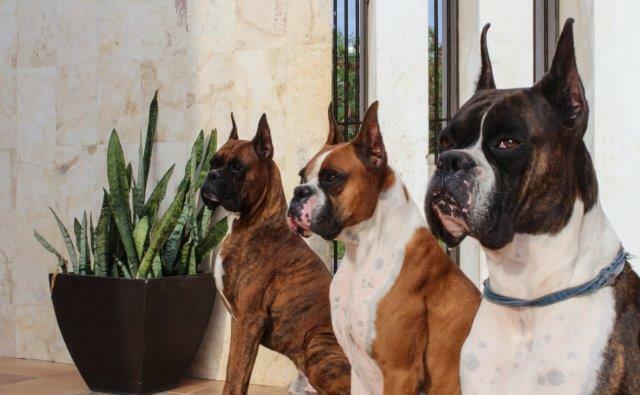 The apparent aggressive appearance of these dogs may be interpreted by a more dominant dog as a challenge for dominance and lead to an unnecessary fight. As with tail docking in dogs, ear cropping in dogs is illegal in South Africa and no vet or layperson may perform this procedure any more unless it is for a valid medical reason.